In most cases, you can mix products from different manufactures without problem - sometimes even trains from different scales can be combined creatively!. "Can I use model trains from different brands or do I have to stick with one?" It's a very common question for those starting out in the hobby. Fortunately, thanks to common standards used by most manufacturers the answer is usually, yes you can. But there are some proprietary patents out there that will limit compatibility. Any train that uses the same gauge should be able to use any manufacturer's track in that gauge. When operating trains from different companies on the same track, the gauge is more important than the scale. For example, G Gauge trains are built to several different proportions, but all share the same wheelbase. But while any G gauge train can ride on any G gauge track, not all G gauge track pieces can be connected to each other. That is because only the distance between the rails is the same between them. Each manufacturers' tracks have their shape to the rails and their method of joining the sections together. This same situation is very common in O Gauge 3-rail track systems as well. With some work, these systems can be made interchangeable, but it will take some work. In smaller scales, things are more standardized, except for track systems with an integrated roadbed base. Fortunately, while the locking systems on the track bed are normally proprietary, the metal joining clips on the rails themselves are not. You can easily mix standard and integrated roadbed tracks of different makes on a layout by using those joiners. Another good example of trains of different scales using the same track would be the case of a larger scale using a smaller scale's track to represent a narrow gauge railroad. On30 trains are probably the most common example. These 1:48 scale (O scale) trains run on HO gauge track, representing a track gauge of 30 inches instead of the normal 56.5". Trains from various manufacturers are very interchangeable between brands. In fact, every car in a train could be made by somebody different. There are a few things you need to know, however. Couplers: Over the years, many different types of couplers have been used on model trains. While things have become more standard in recent decades, there are still lots of older couplers out there. The good news is that in most cases, you can convert to the couplers you use without much difficulty. Command Control: Command control systems have become increasingly popular since the early 1990s. In N, HO and S scales, DCC is the common standard between brands. In almost every case where DCC comes installed on a locomotive, these trains will run on conventional DC controlled layouts as well. In cases where the locomotives also have sound, the extra voltage draw can cause these engines to run at different speeds than non-equipped units on conventional layouts. In O Gauge, Lionel's TMCC and LEGACY command systems and MTH's DCS system are both popular but proprietary command systems designed by the respective companies. Lionel released the coding to its TMCC system early, allowing other manufacturers to use it in their locomotives. MTH has not done the same with DCS. Therefore, MTH's DCS controller can run MTH and Lionel trains, but Lionel's controller cannot operate a locomotive with DCS. Atlas and some other manufacturers' trains also use Lionel TMCC control. Both can run a non-command locomotive. Non-command control locomotives can usually be converted to operate with DCC by adding a decoder. Older locomotives may be more challenging than new ones designed for a quick plug-in installation. TMCC conversion kits are also available in O gauge, although DCC is an option for the larger scales as well. For the most part, power is power. It doesn't matter which brand of transformer you choose for your trains, but there are differences between the requirements of the different gauges. When choosing the right transformer, AC vs. DC, voltage and amperage output and whether you need a fixed or variable voltage will all need to be considered based on your scale and whether or not you run a command control system. So while you have multiple choices for the power for the trains in your scale, it is not a good idea to mix them for different scales. 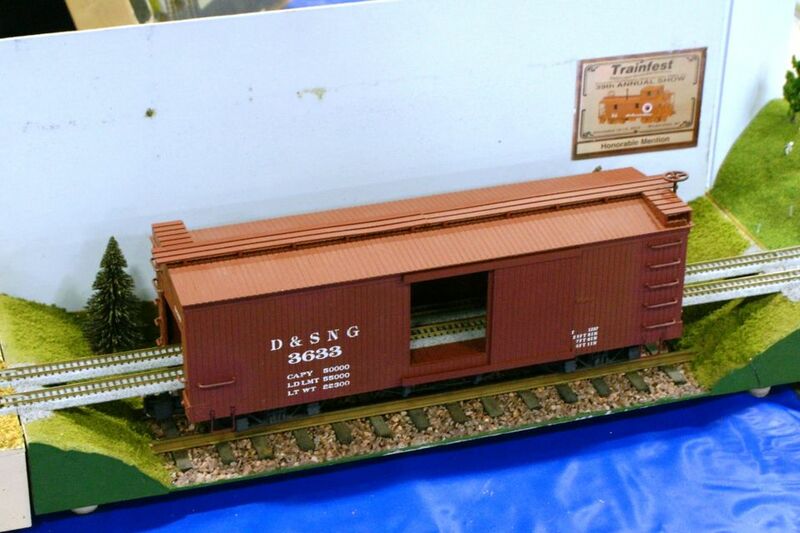 For example, using a power supply designed for O Gauge 3-rail trains is not a good idea for an HO starter set. The only limits on what you can mix when it comes to finishing the scenery features, on your layout, is your imagination. Here even products of a different scale can often be used to create a forced perspective of distance.